We talk a lot in our house about how important it is to make healthy food choices. Not only do we want our girls to have these skills and healthy food habits from an early age, but my 8 year old suffers from migraines that we haven’t exactly determined the source of. Certain food groups are very common triggers, so that adds in another layer to our discussions around how and why we make the food choices we do. Strangely enough, with all of this food talk in our house, it never occurred to me to teach them how to use the Nutrition Facts table (NFt) to inform the food choices they were making. 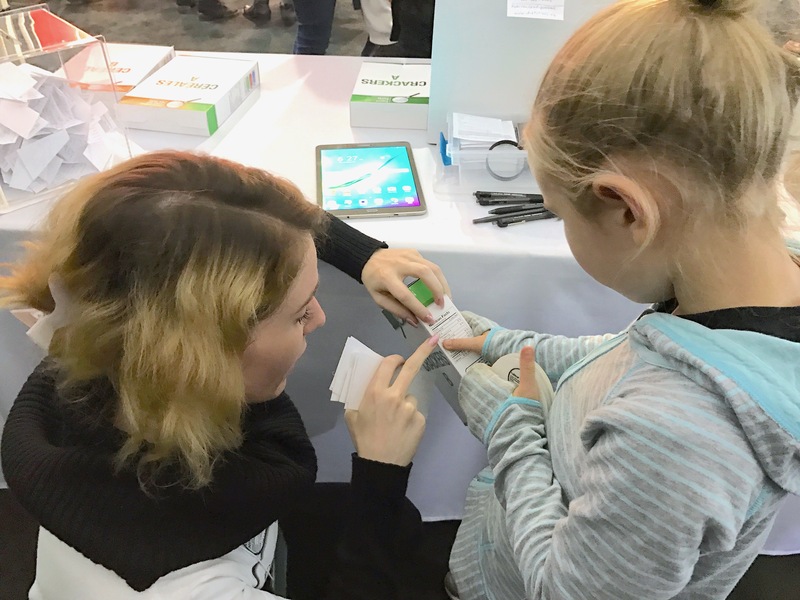 That changed after a visit to the Vancouver Home + Design Show last weekend, when we stopped by the Nutrition Facts Education Campaign (NFEC) experience. One of the helpful staff took the time to teach Adri how to read the Nutrition Facts table (NFt). I appreciated that they never referred to anything on the NFt as healthy or unhealthy, good or bad, or any other influencing language. They gave her the information she needed to know to make up her own mind in a simple, easy to follow way. Serving Size: All of the information found in the NFt is based on the serving size, so be sure to start there. 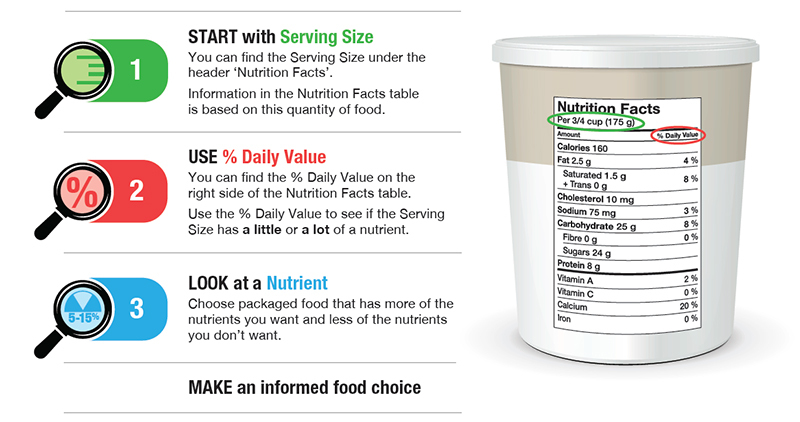 If you eat a different amount than listed in the serving size, you need to adjust the numbers in the NFt accordingly. If you’re comparing different brands of food when shopping, be sure to check if the serving sizes are the same before looking at the rest of the nutritional information. Percent Daily Value: It’s hard to judge whether 2.5 grams of fibre, or any given nutrient is a good amount for a serving of food, but the Percent Daily Value (% DV) offers at a glance, the information you need. A Little or A Lot: The NFt Golden Rule is this: A Percent Daily Value of 5% or less is a little of a nutrient, and 15% or more is a lot of a nutrient. So if you’re looking to have less of a nutrient in your foods, look for options that have less than 5% DV. If you’re looking for a lot of a nutrient, then look for an option with 15% or more! You’ll have the chance to put these new found skills to the test if you are the lucky winner of a $100 grocery gift card. Enter for your chance to win using the rafflecopter widget below. But that’s not your ONLY chance to win! CLICK HERE and take the Nutrition Facts Table Quiz for a chance to win a $300 grocery gift card!! Learn more about making informed food choices, and all the ways you can use the Nutrition Facts Table while you’re there.